Misurata (Arabic: مصراتة‎‎ Miṣrātah, Libyan Arabic: [məsˤˈrˤɑːtæ]), also spelled Misrata or Misratah, is a city in the Misrata District in northwestern Libya, situated 187 km (116 mi) to the east of Tripoli and 825 km (513 mi) west of Benghazi on the Mediterranean coast near Cape Misurata. With a population of about 281,000, Misrata is the third-largest city in Libya, after Tripoli and Benghazi. It is the capital city of the Misurata District and has been called the trade capital of Libya. The harbor is at Qasr Ahmad. The name "Misurata" derives from the Misrata tribe, a section of the larger Berber Hawwara confederacy, whose homeland in Roman and early Arab times was coastal Tripolitania. "Trirone Acrone", The oldest description mentioned by Ptolemy III Euergetes of Misurata because it consists of three heads of land stretching into the sea depth, and got Misurata importance by being at the crossroads of many convoys and also because it is in the middle of an agricultural area as the name of "Cephalae Promentorium" (Kevalay) Greek geographer Strabo. And the city of Misurata is one of the commercial stations that have been built by the Phoenicians, since more than 3000 years (The Tenth Century BC) to the north-western parts of the Libyan coast. The flag then by the name of Thubactis Misurata and know that name in relation to the Berber tribe of Misurata (The Misurateens), which means the sailors. A reconciliation between the two theories is that the city was initially founded by the Romans who referred to the settlement as "Tubartis" or Thubactis and it was later reestablished following the Muslim conquests and named "Thubaqt." In any case, in the 7th century, it served as a caravan supply center and an important port. Merchant traders from Misrata were well known throughout the Sahara during the years of the Caliphate (7th–19th centuries) In addition to its strategic location, the city established itself as one of Libya's oldest producers of luxury carpets. The Misrata tribe, a section of the larger Berber Hawwara confederacy, inhabited the coastal region of Tripolitania during the Roman and early Arab eras. The region of Tripolitania, which included Misurata, came under the regency of the Ottoman Empire in 1551. By the beginning of the 19th century, Misrata had been established as a major center for the Trans-Saharan trade route, where caravans carrying gold, leather, and slaves, regularly stopped. Because of the rainfall along the coast, which was abundant compared to other cities in Tripolitania, and supplemental water from underground springs, Misrata's inhabitants were able to engage in unusually fertile agriculture in this largely arid region. The city was filled with thick areas of vegetable gardens while the surrounding countryside included fields of wheat, barley, date palms and olive orchards. Misrata's artisans also expanded on the city's ancient carpet industry for which it was regionally renowned. Although Misurata contained a well-built harbor, most of its long-distance trade was overland because the city of Benghazi to the east served as the preferable substitute for maritime shipping. As a result of the abolition of slavery and increasing European colonial influence in Sub-Saharan Africa, Trans-Saharan trade declined and consequently Misurata's role in the trade decreased. However, the decline in Trans-Saharan trade saw the establishment of weekly and permanent markets in the city, replacing the seasonal markets associated with long-distance trade. Because of this new economic situation, the residents of the countryside devoted less time to pastoralism, husbandry and guide service for foreign traders and began to shift their focus on agricultural production. Farmers concentrated on growing cash crops, relying on market relations to provide income for their families, instead of subsistence farming and periodic barter exchanging. Bedouins increasingly abandoned their nomadic lifestyle and began to settle into permanent dwellings within the city limits. To cope with an rising population due to immigration from the surrounding areas, Misrata witnessed a construction boom in the late 19th century. A covered produce market and numerous streets lined with shops were built in addition to new district and municipal government offices, a renovated Ottoman army barracks and several Turkish-style houses for the city's wealth families. During World War I, Misurata played an important role in the Libyan-Ottoman resistance against the occupying Italian Army. 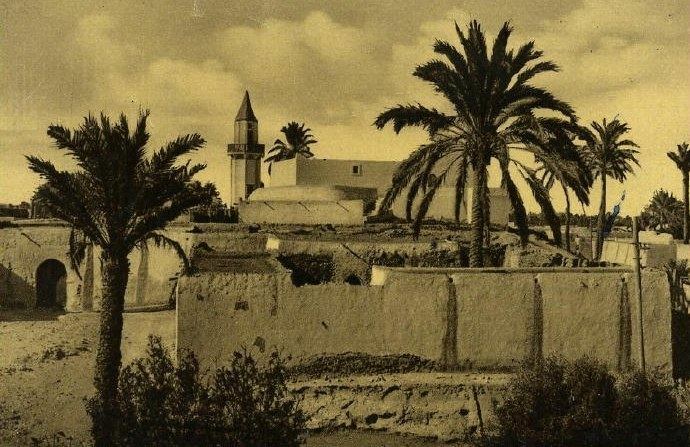 Under the leadership of Ramadan al-Swehli, the city was used a base of support for the Ottoman Empire and his Misratan army dealt a major blow to the Italians at Qasr Abu Hadi near Sirte in April 1915. Over 500 Italian troops were killed while Swehli's troops captured over 5,000 rifles, various types of machine guns and artillery and several tons of ammunition. As a result of this Libyan victory, Italy's army and their Muntasir allies withdrew from Misrata. By 1916, Misrata had become semi-autonomous and collected taxes from Sirte, the region of Fezzan and the area between it and Sirte as well as the Warfalla tribal area south of Tripoli. Because of its strategic harbor, Ottoman and German forces used Misurata as one of their principal supply ports during World War I. The city became the headquarters of a wide-ranging administration which supervised military recruitment and tax collection, had its own ammunition factory, printed its own currency and operated its own schools and hospitals. However, once Nuri Bey, the Ottoman officer in charge of the Libyan front, was recalled to Istanbul in early 1918, Ottoman influence waned in Misrata. Suwayhli lost his main backer and a huge source of funding as a result. When the Italians reestablished their control of much of Libya following their victory in World War I, but al-Swehli retained his position as administrator of Misrata. In 1920 he expelled his Italian adviser from Misurata and controlled the town independently with about 10,000 fighters. Al Rakib, a Tripoli-based newspaper, commended the order and security in place at Misrata under al-Swehli as well as the strict application of Islamic law including the suppression of hard liquor. In June, however, al-Swehli attempted to attack the Muntasirs and Warfalla in the area between Misrata and Tripoli, but his forces were defeated and al-Swehli was executed by Abd al-Qadir al-Muntasir's troops. A few weeks after the battle, the new Italian governor attacked Misrata. During the mid-1920s and 1930s, Misurata became a center of Italian colonization. A new town was laid out on a grid pattern and several public buildings were constructed including a new municipal office, the first hospital of the area, a modern state-of-the-art church (which was later converted to a mosque) and a large hotel. Giuseppe Volpi was named Conte di Misurata, or the "Count of Misurata." In 1935 the construction of the road connecting Zuwara in the west to Misrata was completed. Later un 1937 was built the Via Balbia, a main road that connected Misrata with Tripoli and Benghazi, and in 1938 Libya governor Italo Balbo created on the outskirts of Misrata the new cities of "Gioda" and "Crispi"
In response to alleged vote rigging during the 1952 parliamentary elections, Misurata witnessed mass riots which contributed to the Libyan monarchy's permanent ban on political parties. Following Muammar Gaddafi's coup that overthrew the monarchy of King Idris in 1969, Misurata was tremendously expanded from the 1970s onward. Two iron and steel mills were established in the city resulting in a mass migration of Libyans from nearby rural areas to Misrata and consequently generated population and economic growth. The marina was rapidly developed to host shipping to service the steel plants and other factories with raw materials and other goods. During this period, Misurata became the principal economic, educational and administrative center of eastern Tripolitania. The majority of government ministries have branch offices in the city in addition to several college universities, schools and hospitals. The commercial area of Misurata contains numerous shops, restaurants, and cafes. The extensive development of the city attracted large numbers of immigrants to Misurata, giving it a cosmopolitan atmosphere. The main square adjacent to the old souk resembles those of major Moroccan cities. The battle was renewed with shelling on 20 March as pro-Gaddafi tanks and artillery pushed forward and besieged Misrata. Eyewitnesses reported that pro-Gaddafi soldiers were shooting, killing and injuring unarmed civilians. The city was shelled by artillery, tanks, and snipers, and for over 40 days and had its water supply shut off by Gaddafi's forces. By late April, over 1,000 people in the city were reported killed while around 3,000 were injured. With air support from NATO which entered the conflict on the rebels' side on March 19, and a vital sea based life line from neighbouring country the Island of Malta, anti-Gaddafi forces managed to force loyalist troops to retreat on April 21, gaining control of most of the city by mid-May. Misurata lies on the coast of the Mediterranean Sea 187 km (116 mi) east of Tripoli and 825 km (513 mi) west of Benghazi. The location of the city creates a dualism of sea and sand, bounded by the sea to the north and east and to the south by golden sands dotted with palm and olive trees. 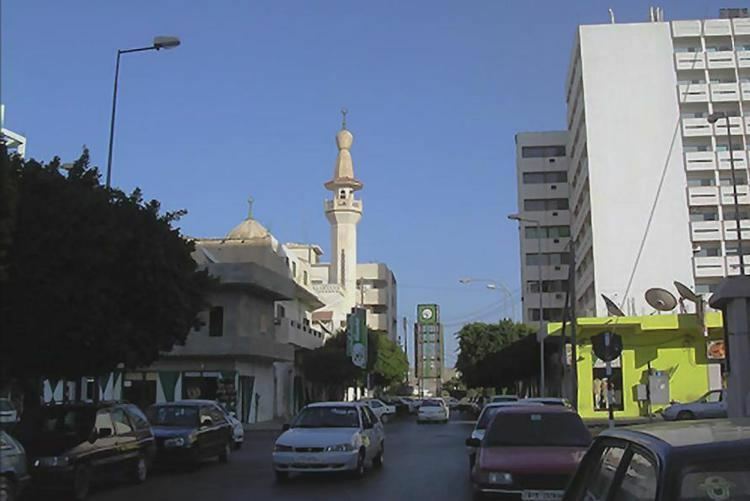 Like Benghazi and Tripoli, Misurata is divided into two distinct sections. Older Misurata consists of small stone houses and narrow arched streets while the newer part of the city, which began to develop in the 20th century, consists of modern buildings, homes, factories and industrial areas. Aside from its distinct location, which makes it a centre for the exchange of commodities and materials with the rest of the cities of the country, Misrata has modern infrastructure, including paved roads, electricity and communications. Misrata University, with its 15 faculties, is located in the city of Misurata. There are several higher education institutions including a number of university faculties that are administratively linked to universities of other cities in Libya. 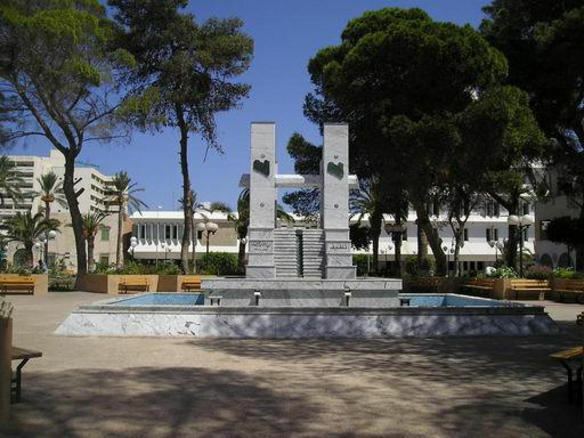 Misurata University is a modern university which was established in 1983, persisting a long-term goal to have an educated community and to end illiteracy and innumeracy in society. Despite its short age, the university has gained excellence in providing the knowledge and skills required for higher education studies, and has enjoyed a great reputation for the teaching, research and training it provides. It has constantly topped the university rankings league in Libya and was recently ranked first in Libya and the 55th in Africa according to the Webometrics Rankings 2013. (e.g. Al-Tahadi University of Sirte and Tripoli University of Tripoli).